Soyuz: Was the Design Stolen? The GE Apollo as it would appear on its circumlunar mission, with its protective shroud and solar power collector deployed. Is the Soyuz Design a Copy of the General Electric Apollo Proposal? The Russian Soyuz spacecraft has been the longest-lived, most adaptable, and most successful manned spacecraft design. In production for over thirty years, more than 220 have been built and flown on a wide range of missions. The design will remain in use with the international space station well into the next century. But did the Russians steal the design from the Americans? When the configuration was first revealed in 1968, some industry insiders immediately noticed a strong resemblance to General Electric's losing Apollo spacecraft proposal. The resemblance was openly discussed by Phillip S Clark and Ralph F Gibbons in 1983. 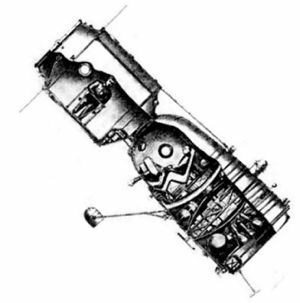 After the Soviet lunar program was declassified, and information on the design of the Soyuz lunar orbiter version was revealed, the similarities seemed even more marked. No Russian source has ever acknowledged a possible connection. Decide for yourself! Put all systems and space not necessary for re-entry and recovery outside of the re-entry vehicle, into a separate jettisonable 'mission module', joined to the re-entry vehicle by a hatch. Every gram saved in this way saves two or more grams in overall spacecraft mass - for it does not need to be protected by heat shields, supported by parachutes, or braked on landing. Use a re-entry vehicle of the highest possible volumetric efficiency (internal volume divided by hull area). Theoretically this would be a sphere. But re-entry from lunar distances required that the capsule be able to bank a little, to generate lift and 'fly' a bit. This was needed to reduce the G forces on the crew to tolerable levels. Such a maneuver is impossible with a spherical capsule. After considerable study, the optimum shape was found to be the Soyuz 'headlight' shape - a hemispherical forward area joined by a barely angled cone (7 degrees) to a classic spherical section heat shield. This design concept meant splitting the living area into two modules - the re-entry vehicle, with just enough space, equipment, and supplies to sustain the crew during re-entry; and a mission module. As a bonus the mission module provided an airlock for exit into space and a mounting area for rendezvous electronics. The end result of this design approach was remarkable. The Apollo capsule designed by NASA had a mass of 5,000 kg and provided the crew with six cubic meters of living space. A service module, providing propulsion, electricity, radio, and other equipment would add at least 1,800 kg to this mass for the circumlunar mission. The General Electric D-2 or Soyuz spacecraft provided the same crew with 9 cubic meters of living space, an airlock, and the service module for the mass of the Apollo capsule alone! The modular concept was also inherently adaptable. By changing the fuel load in the service module, and the type of equipment in the mission module, a wide variety of missions could be performed. The superiority of this approach is clear to see: the Soyuz remains in use 30 years later, while the Apollo was quickly abandoned. To prove that the design could have been borrowed, we have to look at the timing of the design activities in the two countries. In the United States, the earliest manned capsule ballistic designs already exhibited the range of shapes that would be flown later. In response to the US Air Force Manned Ballistic Rocket Research System request for proposal in February 1956, Lockheed, Martin, and Aeronautics proposed a blunted warhead re-entry vehicle form like that used later for the Discoverer/KH-4/Corona film recovery capsules and Biosatellite. McDonnell proposed a shape very like the later Soyuz �headlight' (but with a heat shield that extended a bit around the base). Avco, Goodyear and Convair proposed spheres, like that used for the Vostok spacecraft in Russia. Bell, North American, Republic, and Northrop all proposed winged vehicles. NASA was handed all manned spaceflight projects when it was formed. Initial sketches of the Mercury spacecraft followed by McDonnell proposal and had the Soyuz shape. This was later modified to the simple conical hull of the Mercury capsule. Even while designing this capsule, NASA began considering manned spacecraft to follow the initial Mercury flights. In true government fashion this was determined by a series of committees. On 9 December 1959 the Goett Committee was formed to recommend a post-Mercury space program. After four meetings, they fixed on manned circumlunar flight and landings as a logical follow-on to Mercury. By July 1960, the name 'Apollo' was selected for the program and NASA sponsored its first conference with aerospace industry to outline its plans. On September 13 NASA held the first Apollo Bidder's Conference. Bidders for the study contracts were to concentrate on the following specification: Saturn C-2 compatibility (6,800 kg mass for circumlunar mission); 14 day flight time; three-man crew in shirt-sleeve environment (the three man crew was thought necessary so that they could alternate eight hour duty shifts). A month later, from among 16 bids, Convair, General Electric, and Martin were selected to conduct $250,000, six month study contracts. While this window-dressing was going on, NASA Langley had already decided what the design would be. Max Faget, together with designer Caldwell Johnson, had decided, in the words of Ulysses S Grant, 'it's not what you decide, it's to decide'. And they decided that their capsule would be conical and have a diameter of 160 inches to match the last stage of the Saturn C-2. Later, when the diameter of the C-2 was reduced to 154 inches they rounded the corners to fit. And that was it. While the contractors invested millions of their own money, studying alternatives, doing trade studies, Johnson had already produced design drawings virtually indistinguishable from the Apollo CM that would fly six years later. All of the anguishing discussions that would follow after the decision to go to the moon - the mode debate (direct landing vs. earth orbit rendezvous vs. lunar orbit rendezvous), the launch vehicle debate (Saturn C-3, C-4, C-5, Nova), and so on took as the starting point the 5,000 kg Langley Apollo capsule. In blessed ignorance, General Electric Philadelphia plunged into the project. The Manager of GE Space Vehicle Systems, George Arthur, led a team that included Harold Bloom, Charles Bixler, Jacob Abel, and Arnold Cohen. GE brought to the project the greatest experience in re-entry vehicle technology of any of the study contractors. As early as 1956 GE's Richard Porter had done pioneering work for the US Air Force in solving the re-entry capsule problem. GE was the leading contractor to the Air Force for strategic missile re-entry vehicles, culminating in the enormous Mark. 6 re-entry vehicle for the 3,175 kg Titan II warhead. They also worked on a number of 'black' Air Force programs and provided NASA with the heat shield for the Mercury spacecraft. GE accordingly attacked the re-entry vehicle problem with particular insight. They studied three semi-ballistic designs, derived from their work on classified projects. 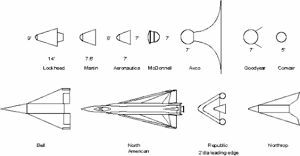 They also considered the winged, lifting body, and lenticular (winged flying saucer) configurations being pursued by the other contractors. For each possibility, two variations were considered: 'integral' (the entire work area was included in the capsule), and 'modular' (use of the mission module concept to minimize re-entry vehicle mass). During the six months of the contractor study, the world changed. Originally this work was being undertaken without any commitment from the government for the massive funding that would be required for the project. President Eisenhower was hostile to NASA spending enormous sums on spaceflight. After the November 1960 elections, NASA hoped that Kennedy would be more interested in their schemes for a costly manned space program. However they found Kennedy to be just as indifferent. On April 12, Russia orbited Yuri Gagarin, the first man in space. Five days later the Kennedy administration suffered a humiliating defeat in the failed invasion of Cuba at the Bay of Pigs. Senators demanded action and held hearings on the Apollo project. NASA seized the day. Congressmen did not seem to blanch when NASA told them it would cost $20 to $40 billion to land on the moon by 1967 - maybe. On May 15 to 17 the contractors presented the results of their Apollo studies. Martin proposed a vehicle similar to the configuration that Faget had already selected. GE reported that their D-2 modular design provided the lowest mass and greatest flexibility. Convair proposed a lifting body concept. NASA administrator James Webb examined the model of the GE D-2, thanked the contractors for their efforts, and announced to the contractors that Apollo would use the Langley design without any consideration of their alternatives! A week later Kennedy proclaimed the moon landing objective as a means of regaining American prestige. NASA plunged into furious action on the crash program. By 28 July Langley had taken the best bits of the study contractor's reports and generated the Apollo technical specification. Twelve contractors, including General Electric, were invited to bid no later than 9 September for the Apollo spacecraft. Following enormous efforts and intense behind-the scenes maneuvering, the contractors grouped into politically saleable teams. GE teamed with Douglas, Grumman, and Space Technology Laboratories. The four other bids were from a General Dynamics / Avco team; a McDonnell / Lockheed / Hughes / Vought team; Martin; and North American. As is usual, the customer spent almost as much time studying the bids as the contractors spent creating them. On 24 November, reflecting mainly the extent to which each competitor had followed Langley's design, the formal bid evaluation was completed. The 'scientific' bid ratings were: Martin 6.9; General Dynamics 6.6; North American 6.6; GE 6.4; McDonnell 6.4. Martin was unofficially passed the word and announced to its cheering workers on 27 November that they had won the contract. However a funny thing happened on the way to the White House, and when the contract award was announced on 28 November, North American was awarded the prime contract. General Electric folded up its tents and went back to building re-entry vehicles for military programs. Seeking professional recognition for their work, Arthur and Abel publicly documented their D-2 design by presenting papers the following December at a special symposium of the American Astronautical Society in Denver, Colorado. In the Soviet Union, manned spacecraft design at this time was solely handled by engineers within Sergei Korolev's design bureau. Korolev had designed the Vostok manned spacecraft that gave Russia the lead in the space race in the first half of the 1960's. Studies for a follow-on to Vostok, with the objective of sending a manned capsule on a circumlunar flight, began in 1959 under Tikhonravov. At this point it was assumed that any such flight would require use of launch vehicles derived from Korolev's R-7 ICBM. Since planned derivatives of the R-7 could not put more than six metric tons into orbit, it was immediately obvious that a circumlunar spacecraft would have to be assembled in low earth orbit from several R-7 launches. Therefore it would be necessary to perfect techniques for rendezvous, docking, and refueling of rocket stages in orbit. By 1960 to 1961 the studies, now dubbed 'L1', were expanded to cover automatic rendezvous and docking of several stages, and use of manipulators to assemble the stages. Meanwhile the configuration of the re-entry vehicle for a Vostok follow-on was being investigated by other sections of Korolev's bureau. Lead for work on the re-entry problem was Section 11. There was no shortage of ideas. In 1959 Chief Designer Tsybin and Solovyev of Section 9 both offered designs for a winged manned spacecraft with a hypersonic lift-to-drag ratio of over 1.0. Prugnikov of Section 8 and Feoktistov of Section 9 proposed development of a ballistic capsule composed of variations of 'segmented spheres'. Korolev requested TsAGI, the state's Central Aerodynamic/Hydrodynamic Institute, to investigate all possible configurations. In a letter from A I Makarevskiy to Korolev on 9 September 1959 TsAGI set out its study plan. Aerodynamic characteristics at various angles of attack for a wide range of winged, spherical, elliptical, sphere-with cones, and conical shapes were to be analyzed at velocities from Mach 0.3 to Mach 25. The ballistic vehicle was to have a basic diameter of 2.5 m, a total internal volume of 3 to 3.5 cubic meters, and a living volume of 2 to 3 cubic meters. Separately considered for all configurations were aerodynamics of ejection seats or capsules with a diameter of 0.9 cubic meters and a length of 1.85 meters. Most of the work was promised for completion by the end of 1959. To exploit this database, Reshetin started a project group to conduct trade-off studies of the various configurations at the beginning of 1960. It was upgraded to a project sector, under the leadership of Timchenko, in 1961. The 1960 studies considered various configurations of ballistic capsule, 'Utka' winged schemes of conventional aircraft layout, and tail-less hybrid configurations. As was done at General Electric, each configuration had a complete theoretical study, from the standpoint of aerodynamics, trajectories, resulting spacecraft masses, thermal protection requirements, and so on. By the end of 1960 it was found that the winged designs were too heavy for launch by the R-7 and in any case presented difficult re-entry heating problems that were beyond the existing technology. Studies of re-entry trajectories from lunar distances showed that a modest lift-to-drag ratio of 0.2 would be sufficient to lower G forces and allow the capsule to fly 3,000 to 7,000 km from its re-entry point and land on the Soviet territory. When the existing guidance accuracies were taken into account, this was increased to 0.3 to allow sufficient maneuverability to ensure the capsule could land within 50 km of the aim point. These studies were the most complex ever undertaken, and Korolev obtained assistance from the most brilliant Soviet aerodynamicists, notably Likhushin at NII-1, and those refugees from Chelomei's take-over of their bureaus, Myasishchev at TsAGI, and Tsybin at NII-88. In 1962 the classic Soyuz 'headlight' configuration was selected: a hemispherical forebody transition in a barely conical (7 degree) section to the section-of-a-sphere heat shield. Section 11 had conceived of the modular scheme to reduce the mass of the re-entry vehicle in 1960. Section 9's competing design was two modules, like Apollo. 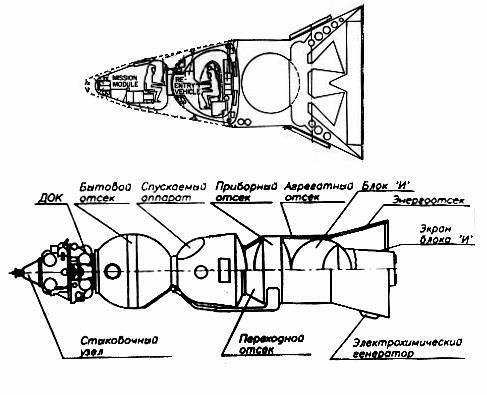 Further iterative studies in 1961 to 1962 reached the conclusion that the Soyuz should consist of four sections. From fore to aft these were the living module; the landing module; the equipment-propulsion module; and an aft jettisonable module, that would contain the electronics for earth orbit rendezvous (this was to be jettisoned after the last docking was completed and before translunar injection. Until recently this compartment on the early Soyuz models was misidentified as a 'toroidal fuel tank' by Western space experts). This configuration was selected only after considerable engineering angst. From the point of view of pulling the capsule away from the rocket in an emergency, positioning the capsule at the top of the spacecraft was ideal. But to use this layout with the living module concept, a hatch would have to be put through the heat shield to connect the two living areas. Korolev's engineers just could not accept the idea of violating the integrity of the shield (and would later get in bitter battles with other design bureaus when competing manned spacecraft - Kozlov's Soyuz VI and Chelomei's TKS - used such hatches). On May 7, 1963 Korolev signed the final draft project for Soyuz. It was presented to the Expert Commission for review two weeks later. 1959 NASA begins internal studies on Mercury follow-on. No contractor involvement yet. Tikhonravov initiates studies of manned circumlunar spacecraft to follow Vostok. Tsybin advocates winged spacecraft. TsAGI generates basic data sets on a wide range of re-entry shapes. 1960 July NASA sponsors first industry conference to advise participants of its (unfunded) plans. Work on circumlunar spacecraft expands. A variety of ballistic and winged re-entry vehicle configurations are pursued. September NASA holds bidders conference for Apollo study contracts. October GE one of three companies selected for study contracts. GE conducts extensive trade studies of various ballistic and winged configurations. Section 11 conceives of modular scheme to reduce mass of re-entry vehicle. End GE studies clearly indicating that modular approach can considerably reduce spacecraft mass. Reentry work indicates winged designs too heavy. Only variations on 'segmented spheres' approach are pursued further. 1961 May General Electric delivers its final study contract, indicating the D-2 configuration is the best. September General Electric delivers its final Apollo proposal, including full-scale mock-up of a conical capsule as desired by NASA. November North American selected for Apollo contract. Spacecraft will use Langley truncated cone ballistic design. 1961 December Arthur publicly documents the D-2 design by publishing a paper at the AAS Lunar Landing Symposium in Denver, Colorado. 1962 Design of Soyuz is refined throughout the year. Definitive 'headlight' shaped re-entry vehicle and final modular design are selected. 1963 May Korolev signs draft project for Soyuz. Externally, there seems to be no case. Due to their concerns about micrometeoroids and radiation, GE planned to leave the spacecraft sheathed in an aerodynamic fairing throughout its flight to the moon. However, the interior layout of the spacecraft reveals another story. If we compare it with the later Soyuz LOK lunar orbiter, which had a larger propellant tank, as did the GE Apollo, the similarities are apparent. On the other hand it can readily be seen that the GE design, while of similar layout, was stouter than that of the Soyuz. There are several points of detailed design that are identical - the flared base of the service module, the spherical + toroidal propellant tanks, the periscope in the re-entry vehicle, the entry hatch in the mission module and the lack of such a hatch in the re-entry vehicle. The re-entry vehicle reveals a similar situation. General Electric's is slightly larger than that for the Soyuz. However developers of the Soyuz recall that it was preceded by the Sever, which had the same size re-entry capsule 'but was 50% larger' (presumably by volume, meaning its dimensions were only 15% greater). A quick glance confirms that the two designs are not identical - the GE capsule has a shallower heat shield and stronger slope on the sides of the capsule. But the Soyuz capsule shown here is the end result of several more years of engineering and test work after the configuration was selected. Finally, the comparison of the masses and dimensions of the Soyuz A reveal a substantial similarity. This table compares the circumlunar version of the D-2, using storable propellants (other variants were considered with cryogenic propellants). 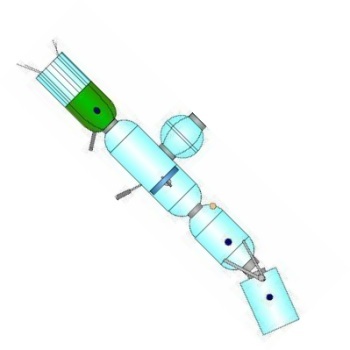 The propellant load of the D-2 for this case is calculated using the stated benchmark of 150 m/s for trajectory corrections on the translunar route (the D-2 design's large propellant tanks could handle much larger amounts of fuel for the lunar orbiter mission). For the Soyuz A the original mass on earth orbit injection was 5,880 kg. But it was calculated 780 kg would be shed in propellant used in earth orbit maneuvers to dock with the translunar rocket block complex and in the jettisoned rendezvous/docking electronics toroid. It can be seen that the two designs are close but not identical. GE devoted a lot of effort on the re-entry vehicle but conducted only parametric studies on the service and mission modules. The Soyuz A design was considerably more complete, with the internal equipment designed in detail. The Soyuz 7K-OK that would fly three years later faithfully represented the internal systems of the A design. However weight growth during development brought its mass up closer to that of the top end of the GE Apollo range. Following bolt-for-bolt copying of the B-29 bomber and British Nene jet engine after World War II, it became the received wisdom of Western aerospace observers that every new Soviet aircraft or rocket was a 'copy' of a Western design. However even if a general layout or form provided some inspiration, to produce the final vehicle still required an enormous amount of analysis, test, and engineering effort. Korolev's other designs - the R-7 rocket, the Vostok spacecraft, the N1 lunar booster - certainly had no such close Western analogues (although in each case there are some similar Western designs - the R-7 packet rocket and the Peenemuende Pfeil; the Vostok and the Convair and Goodyear Air Force Project 7969 designs; the N1 and Von Braun's early 1950's booster designs). It is apparent that Korolev was well on his way to the final Soyuz design before GE had completed its study. But can it be doubted that decisions on certain very specific details - the capsule form, that periscope, the module placements - may have been influenced by American work? Or did GE steal the Soyuz design? 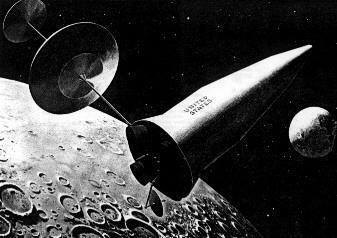 Arthur, George P, "Lunar Spacecraft Designs", Advances in the Astronautical Sciences, Volume 10, 1963. Baker, David, The History of Manned Space Flight,Crown Books, 1982. Clark, Phillips, and Gibbons, Ralph, "The Evolution of the Soyuz Program", Journal of the British Interplanetary Society, , Volume 35, No. 10, October 1983, page 434. Semenov, Y P, et. Al.,Raketno-Kosmicheskaya Korporatsiya ENERGIYA imeni S. P. Koroleva 1946-1996, Moscow, 1995. Gunston, Bill,, Rockets and Missiles, Salamander, London, 1979. Richelson, Jeffrey T, America's Secret Eyes in Space, Harper and Row, New York, 1990. Vetrov, G S, S. P. Korolev I evo delo, Nauka, Moscow, 1998. 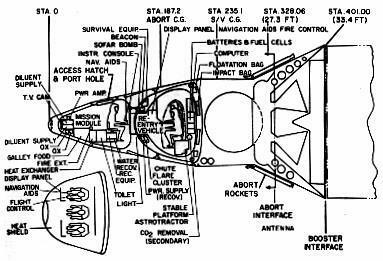 Wachtel, Claude, "Design Studies of the Vostok-J and Soyuz Spacecraft", Journal of the British Interplanetary Society, , Volume 35, No. 2, February 1982, page 92. Before Mercury, the US Air Force had a project 'Man in Space Soonest'. This chart summarizes the initial contractor proposals. The earliest Sever project tackled such problems as manoeuvring in orbit, rendezvous and docking, use of manipulators to move station modules, and testing of lifting re-entry vehicles. Sever (left) was 50% larger than Soyuz, which replaced it by late 1961 in OKB-1 studies. The Vostok-Zh manoeuvrable Vostok spacecraft (right) would be used as a manned tug to assemble the stages in low earth orbit. Original Soyuz A manned spacecraft design as approved in 1963. The Soyuz 7K-LOK that would fly three years later was very similar, except the forward living module was changed from cylindrical to spherical in shape. Comparison of GE Apollo and Soyuz re-entry vehicles.